Men's lab opal and black onyx wedding ring in sterling silver by Hileman Silver Jewelry. 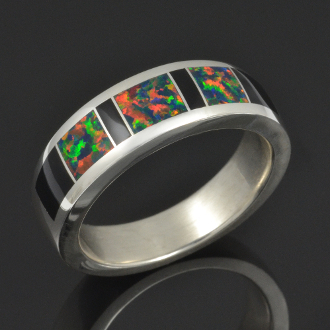 This men's opal wedding ring is inlaid with 4 pieces of black onyx alternating with lab created opal. The lab created opal fires strong flashes of green, orange, red, blue and yellow, mimicking the fire of the best Australian black opals. Lab created opal is more durable and less prone to cracking or chipping than natural opal. Lab opal is basically the same chemical structure as natural opal with the exception of water content. Natural Australian opal has a small amount of water trapped in the stone and in lab opal the water is replaced with resin, giving it more strength. The ring is just under 8mm wide at the top with a slight taper to the bottom. It will be made to order in your ring size in 3 to 6 weeks. The price shown is for men's ring sizes 8 to 11. Sizes over 11 will be an additional charge for wax work and extra silver. A matching woman's ring is also available if you are interested in a matching lab opal and onyx wedding ring set.